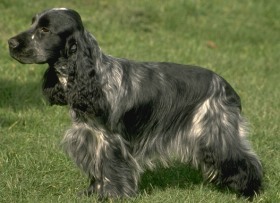 We spaniels were all considered one and the same breed until the latter part of the 19th century. Then we started specializing our talents, according to our size. The larger dogs became flushers of game. My coat is flat and silky and is not overly curly or thick. I am happy, active, and always more than willing to learn what pleases my people companions. I thoroughly enjoy hunting, but I am also a wonderful family pet. When fully grown, I am between 15 and 16 inches tall (38.1 to 40.6 centimeters) and I weigh between 26 and 34 pounds (11.7 to 15.3 kilograms). We have no English Cocker Spaniel Breeders listed at this time. Click here to place your English Cocker Spaniel Ad!